Speaking of protein folding, here's something interesting. One of the most enduring views of protein folding from the last decade is that of an "energy funnel". The funnel was invented by the UCSD chemist Peter Wolynes in the 90s (the original paper is highly readable) and essentially depicts a plot of the configurational enthalpy (or effective energy) of the protein on the Y axis vs the configurational entropy on the X axis. In real situations this plot is multidimensional. The funnel suggests a way out of Levinthal's paradox which contrasts the fast folding times for virtually all proteins with the vast amount of conformational space to be searched. According to the funnel viewpoint, the energy of the protein on the Y axis decreases and becomes more favorable even as the entropy on the X axis decreases, leading to fewer conformations to be searched and allowing the protein to rapidly find the native structure. The funnel has become a mainstay of descriptions of protein folding and has made its way into textbooks. The funnel view of protein folding had always puzzled me a little for the simple reason that we usually think of the enthalpy and entropy of the protein (and in fact of any chemical system) as opposing factors. 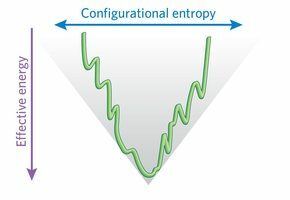 Entropy would hinder the protein even as it formed more "native" contacts and led to a favorable enthalpy. Yet the funnel seems to suggest a synergy between these two factors. Many papers have said that the funnel "guides" the protein to its correct conformational state. In this week's Nature Chemical Biology, one of the founding fathers of the field, Martin Karplus, sheds some light on this confusion and informs us that the traditional view of the funnel is indeed a little misleading. To support his argument, Karplus illustrates two examples of protein folding studies using two kinds of systems. One is a lattice model system in which the protein is approximated by beads on a lattice. Native contacts in the protein are indicated by adjacent beads on the lattice. The other folding simulation is a standard molecular dynamics simulation of an alpha helix. In both cases the proteins are small (about 30 residues) but their behavior at low and high temperatures is intriguing. 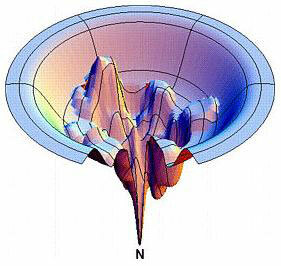 At low temperatures, the folding landscape is more "rugged" and folding is slower. This is a well-established concept and it simply means that there is less energy for the protein to explore all the available local minima. At high temperature the landscape is "smooth" and the protein has enough energy to explore many conformational states. What is striking is that while the effective energy (enthalpy) at high temperature decreases smoothly all the way to the native state, the free energy (which is what we should really be worrying about) has a significant barrier. Thus this barrier has to come from entropy. The crucial thing to note is that at high temperatures, the free energy is dominated by the increasing unfavorable entropy engendered by the greater number of conformations that the protein has to search. Ultimately it's easy to forget that the protein folding "funnel" is only a theoretical construct, an intuitive model. Has anyone actually observed a funnel for a real protein? As the article notes, for now the answer is a decided "No". Unfortunately it may be impossible to ever do so since to construct a real funnel one would need knowledge of every single conformational state that a protein visits on its way to folding. In addition since folding is a statistical phenomenon, one would also need knowledge of every starting trajectory. Needless to say, for now this is at best a pipe dream. However the funnel remains a useful construct provided we remember the subtleties and caveats that Karplus has described. Ultimately it's a model, and like other models it need not be real, but it should at least be useful. Nice article. I don't know a lot about protein folding - but I'm wondering if more shouldn't be made of the fact that the ribosome may be pre-conditioning the folding of proteins. Is it not true that once denatured, folding may not occur again successfully, whereas following ribosome production, folding generally occurs spontaneously? Hey Ash: Don't know when you updated last, but I notice you're not at UNC anymore, but have joined the biotech ranks. Congrats! Thanks, I am excited about the new job! Anon: I think you raise a good point. To my knowledge there's been work on partial folding in the "exit tunnel" but not much structural studies have been done. The funnel picture would be much more plausible if every protein showed two-state behavior. However, it appears that as we develop higher and higher resolution single molecule fluorescence techniques (e.g. Gilad Haran's 2011 Nature Paper) we're seeing more and more complex behavior that can't be described by two state models. The funnel is a simple model that helps explain low resolution experiments (melting curves, etc), but is insufficient. A more general theory that can explain both two-state and multi-state behavior is needed.